Born in 1952, "Sly" (who nicknamed himself as a tribute to Sly Stone) Dunbar is a Jamaican drummer virtuoso and pioneer of reggae drumming. He forms with Robbie Shakespeare, bassist, the most popular rhythm section in the history of reggae, "Sly and Robbie". His trademark is an imitation of the African percussive style with a dry playing (muffled toms, rim shots (even on the toms), timbales, electronic pads, etc.) with single stroke roll, triplets and offbeats (especially for the hits). Very inventive, each piece is an opportunity to different polyrhythms especially with the addition of small percussion instruments taken from Brazil and Cuba (in rerecording or with another percussionist), with a perpetual reinterpretation of basic rhythms. 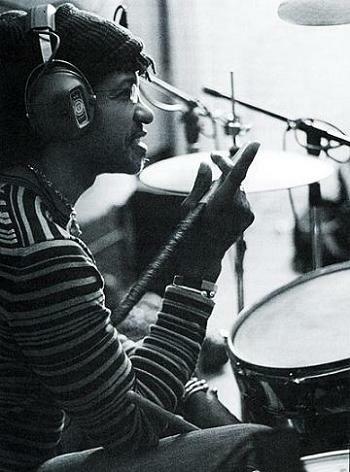 Sly Dunbar also created a lot of "riddim" ("rhythm" synthetic compositions for the ragga muffin singers background, Jamaican style in vogue in the 1990s, and which inspire today largely rap, soul and dance music as well).